The sampling of high-pressure fluids including boiler water and steam at elevated temperature is an essential part of the modern process industries. Continuous-on-line analysis is used in many industries to malfunction. This is supported by manual sampling for specific parameters at strategic point in the process. The system used vary in complexity from a single probe with cooler, pipe-work & valves for manual sampling, to be fully automatic multi-stream sample conditioning system consoles for centralized monitoring. In the power industries control of water purity is a pre-requisite for the safe and efficient operation of process streams, both aqueous and organic is in essential part. However the properties of the process fluids demand stringent requirements of the sampling equipments. Dandekar Industries has developed a compact and efficient sample cooler after rigorous trials and development efforts. Following data is necessary for selecting appropriate SAMPLE COOLER to meet your requirement. Pressure of Available Cooling Water. Temperature of Available Cooling Water. Drain Connection of Cell Required. We can supply coil of SS304 / SA 106 / COPPER / SS316 / CONSTRUCTION and cell of Mild Steel / SS304 in construction depending upon the application, material of other quality on request. Our coolers are operating at maximum pressure - maximum temperature. 2 MM THK, 160. M LG. The quality of end products depends upon the process efficiency. Such sample coolers enable you to take a sample at various stages iron the juice line or any other process line. This would ultimately result into better quality. Considering the above advantages many suger and chemical industries already installed these equipments. The quality and reliability of these equipments have enabled us to get an original equipment supplier status from Thermax ltd.& Krupp industries Ltd. Sample cooler for safe and accurate boiler water and chemical material sampling. Eliminets flashing off from the sample & false water analysis. Counterflow design for efficient cooling. 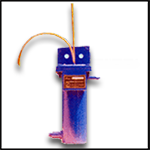 Fixed or removable coils of copper or stainless steel. Complete with compression fittings for sample connections.